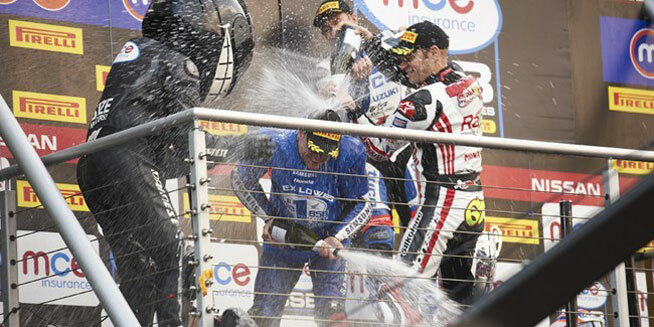 Samsung Honda's Alex Lowes celebrated a maiden MCE Insurance British Superbike Championship title win for Samsung Honda at Brands Hatch this afternoon as he made history to become the youngest winner of the crown after finishing ahead of Shane 'Shakey' Byrne. Josh Brookes was again victorious as he made it a hat trick of victories for Tyco Suzuki as he edged out an advantage on track as he led from the start, but all the drama was between Lowes and Byrne. On the opening lap Byrne carved his way through from the eighth row to be running seventh on the fourth lap with Lowes in fourth. The atmosphere was electrifying as Lowes moved to third on the fifth lap but Byrne was closing in and was fourth by lap six. The pair then had Jon Kirkham ahead of them and Lowes made a move on the Buildbase BMW rider at Surtees and Byrne made a move at Pilgrims Drop and they were inseparable again. A lap later and Byrne made a move on his rival Lowes at Surtees to move ahead in the title battle but a moment at Clearways cost him and Lowes tried to pass into Paddock Hill Bend but the Rapid Solicitors Kawasaki rider held the line. Byrne held the advantage until the 16th lap when Lowes made a move down the inside at Graham Hill Bend. Byrne was pushing to make a pass but Lowes had the edge and on the final lap a slide from Byrne at Druids cost him. Despite pushing hard he was unable to get back ahead of his Samsung Honda rival and Lowes claimed second place to lift the crown. Lowes said: "I'm pretty happy about it! At least now Sam can't take the mickey out of me as he would have been giving it to me all winter if I'd been second. It was an unbelievable last race and really difficult. I just didn't know how much to push. I saw on my pit-signals that Shakey was closing on me and that is the last thing you want to see. It was a case of keeping focussed and when he got by me I knew that I had to pass back if I wanted the title and I pushed really hard. I had a few moments but luckily kept it all together and beat him and to me that really is incredible." Samsung Honda's Alex Lowes left it until his last lap of the final MCE Insurance British Superbike Championship free practice session to mug Josh Brookes of the top spot after the Australian had moved ahead just a lap earlier in the frantic final minutes. The damp session initially got underway with Freddy Foray on the Samsung Honda at the top of the times as the Frenchman was the first rider to complete a run of laps before PJ Jacobsen moved ahead to put the Tyco Suzuki at the top of the times. The American didn't hold the position for long as his team-mate Josh Brookes displaced him from the top just seconds afterwards. Brookes' position at the top then came under threat from defending champion Shane 'Shakey' Byrne, the Rapid Solicitors Kawasaki rider moved to the top of the times with just over ten minutes remaining of the session after sitting out the early part. Brookes was on the counterattack though and he moved back ahead of Byrne within minutes and the Tyco Suzuki team continued to improve as they bid to maintain the top spot. Lowes though was on a run of laps and with less than five minutes remaining he pushed himself to the top of the timesheets but again Brookes moved back ahead as the time ticked down in the session. Lowes left it until his final lap to shoot back to the top and despite another lap from Brookes it wasn't enough and Samsung Honda topped the session for the second time this weekend. Brookes was second fastest ahead of team-mate Jacobsen and Byrne as they prepare for this afternoon's Datatag Qualifying and opening race. James Ellison was the first of the Milwaukee Yamaha riders in fifth as he climbed the order ahead of Foray and Padgetts Honda's Jakub Smrz. Chris Walker and the Quattro Plant Bournemouth Kawasaki team were eighth fastest as they maintained their position in the top ten with Jon Kirkham and Karl Harris completing the top ten. Which System Do You Want? Datatag's state of the art identification technologies are probably the most sophisticated Number 1 Security Marking and Registration Systems designed to stop theft.